yes, this is correct. When you run file backup (and that is the only option available in Backup for Linux) there is currently no way to make CloudBerry re-backup everything that has not changed. Our Backup is incremental whether you use Block Level option or not. ... Full versions of files. These are the exact copies of what the file was before backup. Like really just a copy, byte to byte. These are the delta (or the sum of changes) between the latest Full version and the current state of the file. If you have Block Level Backup enabled and a Full Schedule configured you will not need to go through months of incremental versions of files. The restore process will pick the latest Full version and apply any Block versions to it if needed.
. 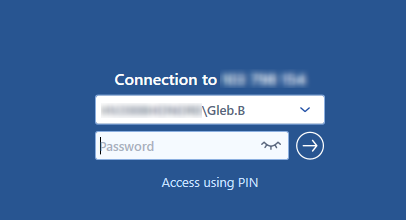 Using PIN is just another option, it is absolutely not required when using Unattended Access. Since Remote Assistant v 2.1 it doesn't even look like you need to use PIN (this was an issue in prior versions). See my screenshot below. You get to this step if there is a live user session at the remote computer at the moment. If there is none, you automatically get to the Windows authentication screen. So honestly I do not understand what causes this confusion. About the mouse and keyboard - it is true, in some cases the PIN connection doesn't work properly with the secure screen. Looks like this is the core reason. Try Unattended Access, I'm pretty sure the controls will work just fine. We are working on the fix to this, it should be available in one of the upcoming updates. The blank screen is not a known issue so please send us the diagnostics from Remote Assistant agent (Menu > Diagnostics > Send) and refer to this Forum. the logout will be done automatically. The encryption key is not enough because Remote Assistant cannot log into a user session without knowing the user password - that is a security restriction of Windows OS. As a matter of fact, CloudBerry Remote Assistant is a freeware and we are going to keep the free version (no plans to remove it) along with the paid version (that is coming in the mid-term future). The features are described on the product page of our main website, please check them out.
. Currently using 2 screens at once is not supported yet, but we are going to add it in one on the future updates. That's a separate issue, non-Managed Backup does not interact with CloudBerry servers during backup/restore operations. Please open a support ticket by sending the diagnostics (Tools > Diagnostics). , gotcha, thanks. This feature is on our roadmap for the near future, although I am not sure whether it will be available in the freeware version or only in the paid version. , what kind of information do you want to be displayed there?